“The Creative Triangle” is a highly effective drill because it allows you to simultaneously train your feet and your cognitive skills. The poles represent defenders and on each pole you have to execute a different move. Here the kids perform the Rivelino at pole one, the scissors on the second pole and the side step on the third. They have to execute the correct move on each position as quickly as possible. The young soccer players have to be able to think “around the corner“ because they need to be aware at all times of which side of the pole they have to go around. This is quite challenging, regardless whether they’re doing a Rivelino, the Scissors or a side step. There are many different variations and the kids can also develop and implement their own ideas. They should not only go clockwise but counter-clockwise as well, and they can also change up the moves at the three poles. After a while the kids should switch to doing the scissors if they were initially doing a Rivelino at the first pole. Same on the other two poles. It’s also possible to call for a roulette move in between the feints to further enhance the kids’ skills. If the moves are predetermined on the first two poles maybe they can improvise what they’re going to do on the third pole. Of course it’s also possible to let the kids improvise on all three poles. You just have to remind them to always go full speed here since they have to be able to execute the moves on a high level later on during the game. You will probably come up with a number of combinations yourself, and that’s great because coach Nowak only gives you the framework and the rest is up to you and your player’s creativity! Learning how to win one-on-one situations with ease. Including moves from many European top players. Find out the secrets to becoming a successful soccer player. 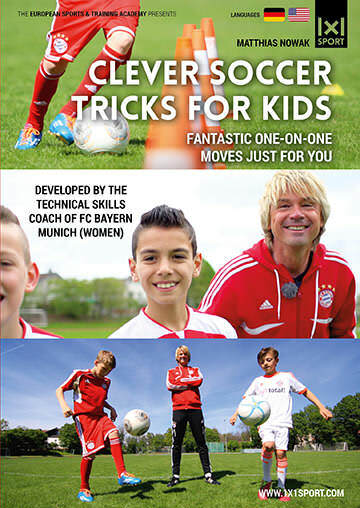 Developed by FC Bayern Munich women's coach Matthias Nowak.